Sun., Nov. 5, 2017, 8:57 p.m.
BIKING -- Mountain biker Dan Wilson plummets down an "advanced" roller feature at Beacon Hill/Camp Sekani area. The rock is a purely optional route just above the trail Old School. 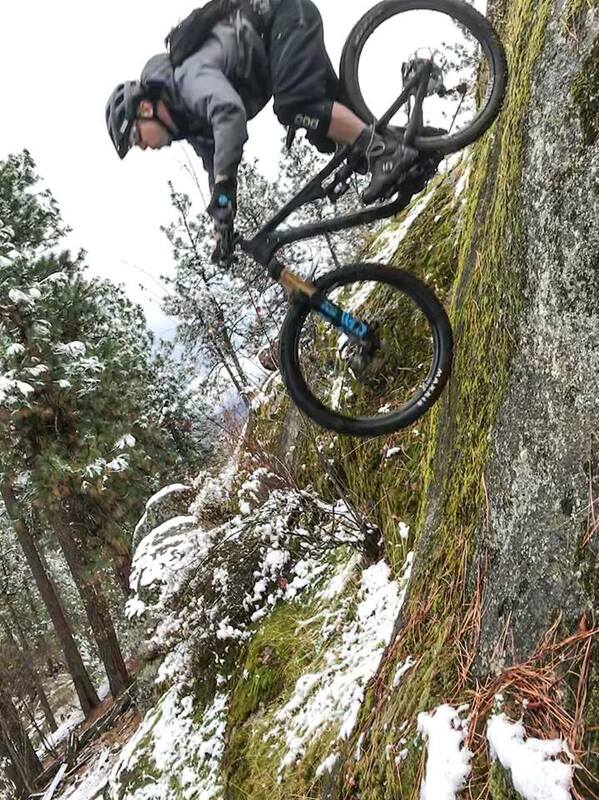 "It's one of the many rocks up at Beacon, one if not the steepest rollers up there," says Wilson, a leader in Evergreen East (Mountain Bike Alliance). "Doesn't even look possible from looking up the rock, but once you have learned how to conquer the fear it makes sense. Camp sekani features a wide variety of rock rollers such as this. "They are technical rolls -- Good Times and Kessle Run are also trails that feature some of these nice large boulders," he said. When I asked for an estimate of money spent on hospital bills, he said "none," adding, "but if one were to get shy and not commit it would be broken bones or possibly death. "Definitely recommended to work up to steep rolls and confidence before attempting." Wilson says it's important to note that this feature is not part of the trail Old School (it just feeds into the trail) nor is it required when riding the route. "It is completely optional," he said. Beacon Hill, which overlooks the Spokane River near Upriver Dam, has some great rollers including the large rock wall on Pop Rocks, the Spine which feeds into Tire trail and many rocks around Sekani that can be sessioned including in the skills area on the east side of the park, he said. "Explore -- it is worth riding off the normal paths and checking out features all around Upchuck and Banzai Kitten," he said. "Evergreen East tries not to create trails that have inherent risk without labeling them appropriately. More signage on order and big plans to outfit Beacon Hill with better directional trail markers. This will aid in preventing newer riders from potentially getting onto trails that are beyond their skill level." Rich Landers joined The Spokesman-Review in 1977. He is the Outdoors editor for the Sports Department writing and photographing stories about hiking, hunting, fishing, boating, conservation, nature and wildlife and related topics.